By now, the Village Service work was falling into some kind of a pattern. Every evening after Bhajans, some of the teachers from the University would do the sorting of the clothes for the distribution and plan the loading operations. 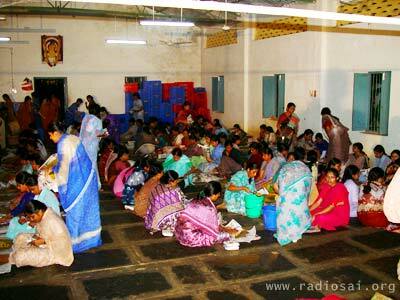 The clothes were all stored in the Poornachandra Hall [there was no other closed space big enough to store them all! ], and it had the look of a warehouse, with trucks lining up one after another for loading! Other teachers would be engaged in logistic planning, based on the information collected. Vehicles were deployed as required. Student volunteers and teachers were given the necessary instructions and briefing, including route maps etc. Back-up and fall-back arrangements also were organised. 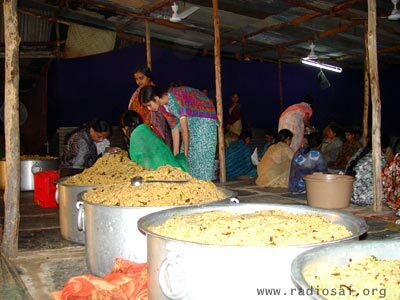 After dinner, the kitchen-operations would be in full swing, and as things got ready, the lady teachers and the girl students of the Anantapur Campus would start the packing, preparing food packets in thousands, sometimes sitting all night. 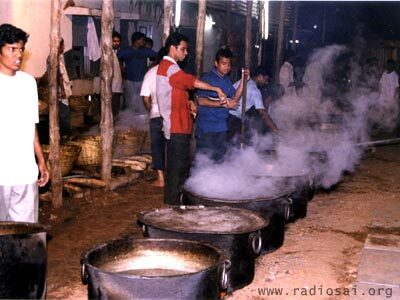 By 5 A.M., all the trucks would line up near the North Indian canteen, the final loading point. Huge crates containing food packets would be loaded into them one by one. Some of the trucks would carry both food and clothes. Many tractor-trailers also were pressed into service. 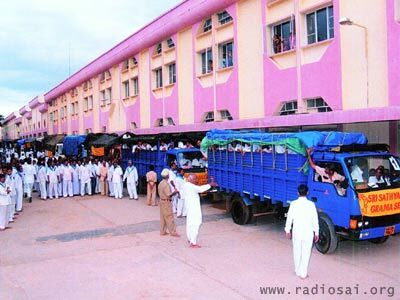 At 6 A.M., the loading operations would be temporarily suspended so that everyone could assemble for morning Darshan. Swami would come out at about quarter-to-seven, slowly walking past the ladies and the gents. He would then go to the veranda, have a word or two with the Mr. Narasimha Murthy, Warden of the Brindavan Hostel. 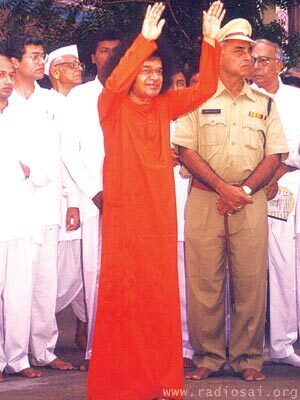 The Warden would then seek Swami's permission and Blessings. That would be the signal for all the boys to rise. Marching in rows of three, the entire group of teachers and boys (including of the Higher Secondary School) would commence their circumambulation of the Mandir, one group chanting Vedas and the other group singing Bhajans. After all the students and teachers have left the Sai Kulwant Hall, some senior devotees in the veranda would rise to seek Swami's Blessings and they too would come out to get ready for service. The idea of doing service had now become infectious, and many elderly devotees eagerly sought Baba's permission to join the students and contribute their bit. By around eight A.M., the trucks and the tractors would start rolling out, with boys singing Bhajans and shouting Jai! Over a thousand people went for service every day. Elders would accompany in cars, vans and jeeps, while two mobile squads equipped with wireless would also leave to provide mobile co-ordination as needed. To make sure that no time is lost, all vehicles were required to be refuelled the previous evening itself. One of the elders merits special mention. He is Mr. Chiranjeevi Rao. Often described as Swami's shadow in Prasanthi Nilayam, he was specially deputed by Swami to make sure that people in all the villages visited were happy, that no deserving person was missed out for any reason whatsoever, that everything went smoothly, and that all the students ate at the appointed hour. Every evening, he had to personally report to Baba that people in all the villages visited were content. As a part of his responsibility, Mr. Rao also took upon himself to give fatherly advice and guidance as required, and do trouble-shooting if necessary. He knew this region like the back of his hand, and also the village elders in some of the bigger villages. Even so, it was a towering assignment for one pushing eighty-one and with a medical history behind. But when one works for Swami, He gives all the required strength. This was very evident from the way Mr. Rao exerted himself without a moment of rest, from eight in the morning to about three O'clock in the afternoon, sometimes up to four, or even six O'clock. He took particular care to oversee operations in the so-called "difficult" centres, where there were large crowds due to high expectations. In one place, food supply might be in excess while in another place it would be running short. Taking advantage of wireless contacts, Mr. Rao would see to it that there was the required redistribution so that the glitch was overcome. When others were winding up operations and preparing to return to Puttaparthi, Mr. Chiranjeevi Rao would still be going round from village to village, personally checking that all the deserving poor had been given food and clothes. If he felt that some people had been inadvertently left out, he would make amends on the spot. In many villages, he would call on the local elders and seek their help if required. This was also good public relations! He would make sure that when he left, everyone was pleased with the attention they had received. He would go to any length of trouble just to make sure that everyone was happy. As if all this was not enough, he would, during his movements, stop by the roadside and distribute food and clothing to farm workers, whenever he found a deserving person [it was the ground-nut harvest season, and many people were busy in the fields]. One day he heard at about two O'clock that in a village some distance away, there were hundreds of migrant farm workers who had come in search of jobs, from as far away as seven hundred kilometres. Mr. Rao tirelessly tracked them down and made them all happy. While he would sternly admonish students and teachers if they did not eat their lunch promptly [as per Swami's instructions], he himself would be busy working. Only after repeated pleas by those accompanying him would he agree to stop his vehicle near a shady tree and hurriedly gulp a few morsels of food, by the roadside. The way he insisted on meticulously complying with each and every instruction of Swami, was an object lesson to all that observed him. To get back to the main story, after leaving Prasanthi Nilayam, the convoy, made up of trucks, tractor-trailers, wireless-equipped monitoring jeeps, vans, and the cars carrying the elders, would head towards the target area for the day. Mr. Chiranjeevi Rao would form the rear-guard, having made sure that the 'launch' was smooth. En route, the boys would be singing Bhajans, and in many places people standing on the roadside, especially children, would cheer, wave hands, and greet by shouting "Sai Ram!" On approaching the designated area, the different service teams would peel off to their respective destinations. The unwritten rule was that to the extent possible food service should begin by 9 A.M. To meet this requirement, in a few cases the food trucks would leave early, sometimes as early as 5 A.M. Despite this, in one instance, the truck could reach the designated village only by around 10.30 A.M, though the village was only 35 kilometres away - that in itself is a sufficient commentary on how bad the roads [where they existed!] were. 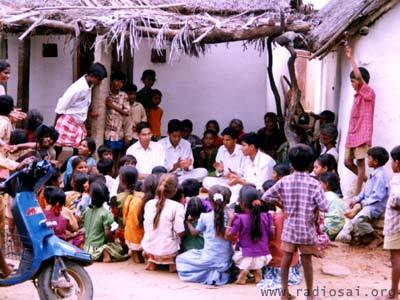 In every village, the students would park the truck at a central spot and then go round a few streets singing Bhajans. After this Nagarsankeertan, the Prasadam distribution would start in right earnest. 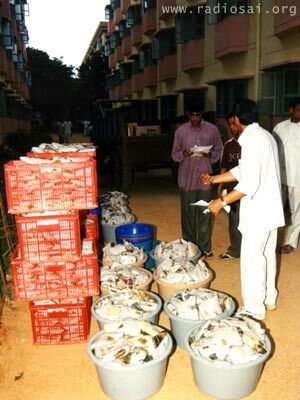 Unloading the food baskets from the truck, boys in threes and fours would go from hut to hut, door to door, and distribute Prasadam. When the food basket became empty, they would come back to the truck for a refill. Even isolated houses were covered. 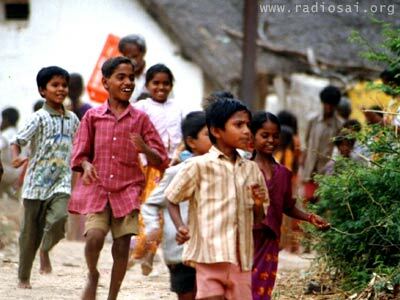 Swami often arranges for the distribution of Prasadam in Prasanthi Nilayam, and while the distribution is in progress, He always moves around, doing spot checks, "Did you receive Prasadam?" This is in the Indian tradition.While doing village service, the boys did not forget the example set by Baba. While some were serving, others would do checks just to make sure that no one was left out.